This beautiful old window has outlived the original frame, and has been rehoused in a substantial pine frame for display purposes. Removed from a house in YORKSHIRE during refurbishement. A window of outstanding beauty depicting a new bloom in flower pot - with exceptional coloured glass and rondels. This coloured glass is of a heavy and deep texture. 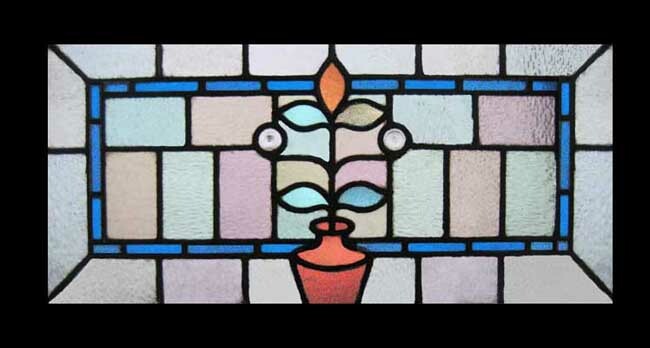 BEAUTIFUL RICH COLOURS - PINKS - BLUES - GREENS - BRONZE The leads & Glass are in sound condition. The frame measures 36 W" x 19 1/4 H" . The glass measures 33 " x 16 1/4 " . Shipping and packing for USA would be $199. You can buy this now in your own currency by clicking on the credit card icons (Paypal if you prefer) below the photograph or e-mail sales click here to arrange payment by personal check ,money order or bank transfer. Shipping includes full insurance.